ARE YOU A REAL SCIENTIST? And the answer is “no” to the secret lab and “yes”, I am a real scientist. I have a master’s degree in Plant Science with an emphasis in Molecular Biology. I spent several years working in a lab with little mustard plants (Arabidopsis thaliana) trying to understand how a small piece of DNA affected flowering. And even more importantly than my degree, I am a scientist because I am curious, I love learning and I’m dedicated to seeking truth and making careful observations. While my background is in genetics and botany, I’m interested in pretty much everything science related and enjoy studying a wide variety of topics. HOW’D YOU GET THE NAME SCIENCE MOM? 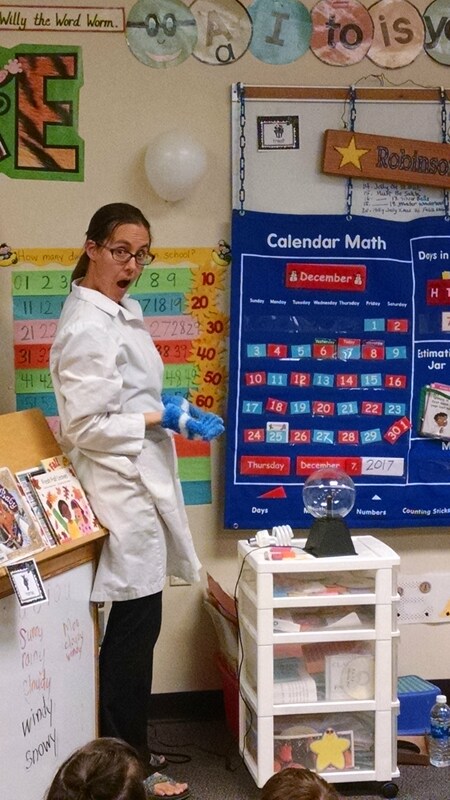 In 2014, I volunteered to do weekly science demonstrations in my son’s second grade class. The kids started calling me “Science Mom” instead of “Andrew’s mom.” The name stuck and the job grew. Within a year I was visiting ten classrooms a week, all in the school where my kids attended. In late 2016, I started a YouTube channel and began visiting other schools outside of my hometown. CAN YOU COME TO MY SCHOOL? WHEN AND HOW MUCH? Maybe! I charge $200 to do a school visit. 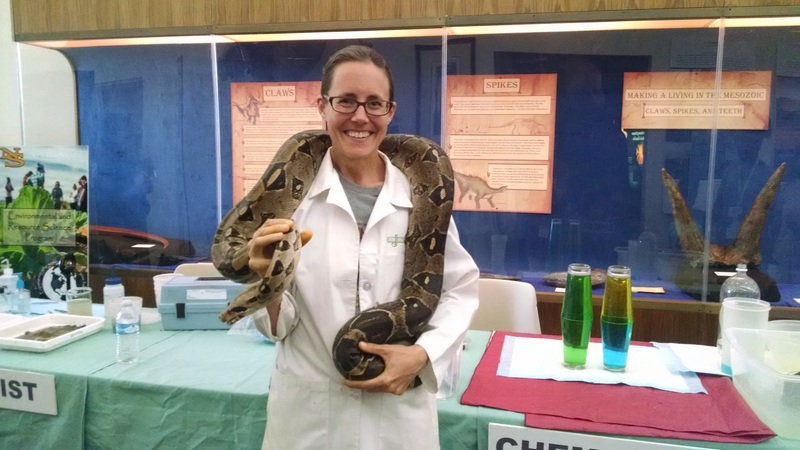 I bring my own supplies for some great science demonstrations and come for the entire day. I’ll do as many presentations as the school would like me to do. A typical format is to present lessons to combined classes every 30 minutes, but I’m very flexible. I’ve done whole-school assemblies and conducted hands-on workshops with a half-dozen students, and everything in between. Once a month, I give away a free school visit, thanks to the support of my Patrons on Patreon. If you’d like to enter into a drawing for that visit, fill out and submit this form before the 10th of the month. If you’re in the Las Vegas area, chances are good I’ll be able to get you on the calendar. If you’re outside the Las Vegas area, the chances are smaller that I’ll visit, but there’s still a chance. I travel regularly into Utah and California and Arizona to visit friends and family, and once or twice a year I attend conferences in other parts of the country. Math is the key to science, but people sometimes run into trouble with their math journey because math is something that builds, and one weak concept can cause the whole thing to come crashing down. This fun visual exercise helps teach how vital practice is for building a strong math foundation. Water is one of the most incredible substances on the planet. Science Mom displays three hands-on investigations that are easy to replicate at home, showing just how extraordinary this ordinary substance really is. 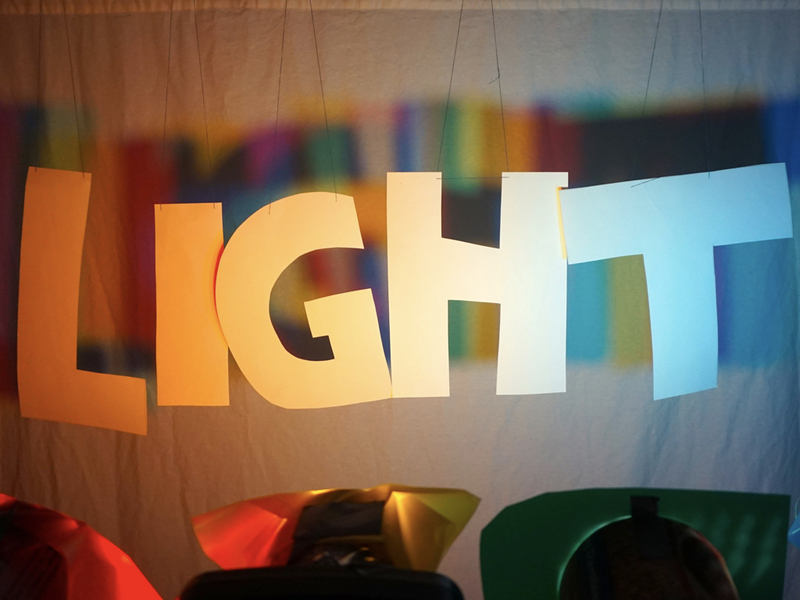 You’ve probably seen that white light can be split into a rainbow of color, but did you know you can combine colored light to make white? Light is one of the most mysterious and interesting things we interact with every day. We still don’t understand exactly what it is. But we do know that it travels in waves, and understanding a bit about those different wavelengths can enrich our understanding of this extraordinary phenomenon by a lot. Electricity is something we use every day, but how often do we stop to think about what things conduct current, and why? With a plasma ball, Science Mom demonstrates which materials conduct electricity and explains how this fascinating phenomenon works. During the workshop, we’ll also take a look at static electricity, moving balloons and cans without touching them, and making orbs of tinsel levitate into the air. 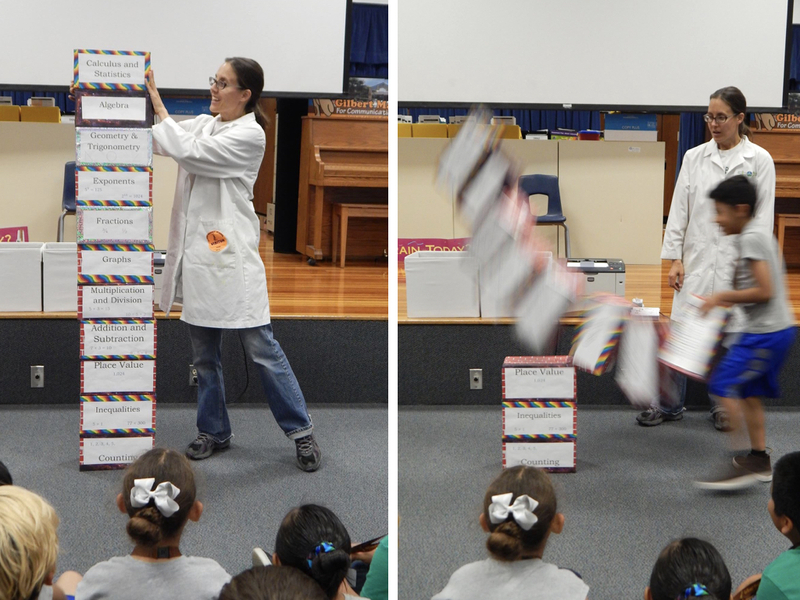 What does a scientist from long ago have to do with airplanes and floating ping pong balls? As it turns out, quite a lot! Science Mom explains the Bernoulli effect and how a single principle of physics allows us to predict and manipulate one of the most dynamic and interesting fluids we interact with: air. Mentos plus soda has become an iconic example of a chemical reaction. But what causes it? Is it a chemical reaction, or a physical reaction? And if mentos work, then what about other materials like sugar, salt, or sand? 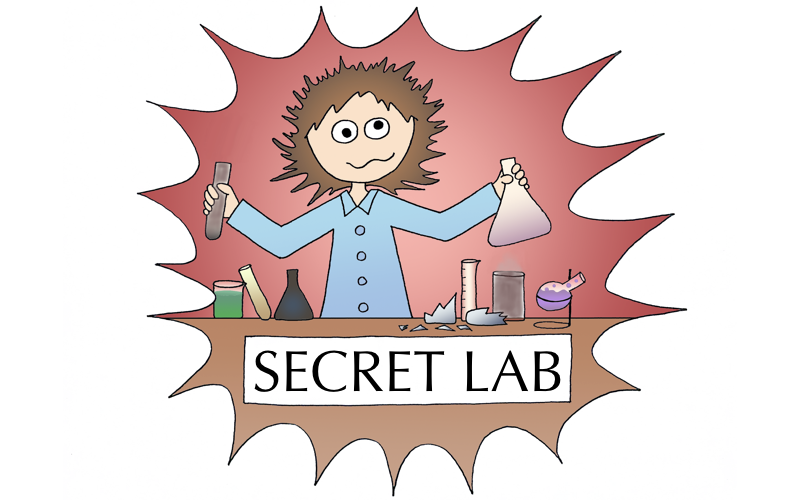 Science Mom unpacks the scientific method and how it can help us get to the truth of the matter in this sticky experiment. This demonstration must be done outside. Water ice can float and melt and change before our eyes, but what happens if you freeze carbon dioxide into ice? States of matter becomes a magical topic as we make quarters dance and sing, create iridescent bubbles that burst with white fog, put out candles with invisible forces, and learn about the importance of safety precautions and applied knowledge. There’s no other word for it, this lesson is sublime. How does a book or video get from idea to publication? When do you know if an idea is a good one or a dud, and can one turn into the other? Storytelling is a universal art, and video production and book publishing share many interesting parallels. But there are also fascinating differences in how we create and view books versus videos. Science Mom shares her own expeirence as an author and YouTuber to teach how stories can be created, shared, and change the world around us. Best for ages 9 and older. Most often, the school provides a cart for supplies and I spend the day there and travel from classroom to classroom teaching lessons every 30 minutes. I also have experience presenting to adults. Contact me for more information about my workshops and talks developed for homeschoolers, educators, and writers. IF YOU’RE SCIENCE MOM, THEN WHERE’S SCIENCE DAD? Follow this link to read a short interview with Math Dad (and see the cartoon I drew for his Patron card in the Periodic Table of Patrons). You can see more of Math Dad in the weekly “Science Mom vs. Math Dad” videos we post each Friday. Yep. I draw all my own comics and illustrations for the Science Mom Guides. HELP! MY FOLDABLE BOOK DIDN’T TURN OUT RIGHT! Folding these little books can be challenging, especially if you don’t have a lot of practice with spacial puzzles or oragami. But don’t fret! I have a video you can watch–it’s the very first video I ever made–and it shows how to fold the books. Hopefully it helps you out. Sometimes a little practice is all you need. But if you find that you’re still struggling to get it to turn out right, you can always cut the paper into 4 horizontal strips and glue it together by page numbers. HOW DO YOU START A YOUTUBE CHANNEL? The short answer is that it’s a LOT of work and a long road to earn a living as a YouTuber. I don’t recommend it as a vocation unless it’s something that you’re passionate about. My total earnings from YouTube during my first six months of making videos was 1 dollar and 1 cent. During that six months, I put more than 360 hours of work into my channel. I pulled all nighters editing videos and drawing cartoons because there simply wasn’t enough time to do things during the day. Our family ate Panda Express for Thanksgiving Dinner because my husband and I were too busy getting the website ready and filming SMG1 (Science Mom’s Guide to Water, Part 1) to cook the traditional turkey dinner… you get the idea. So if I’d started the channel because I wanted to make money rather than because I wanted to share science with the world… I would have been very disappointed! WHERE DO YOU GET YOUR IDEAS FOR SCIENCE PROJECTS? The internet! The internet is a crowded and messy place full of both treasure and junk, and there are many glorious science-related ideas in it. 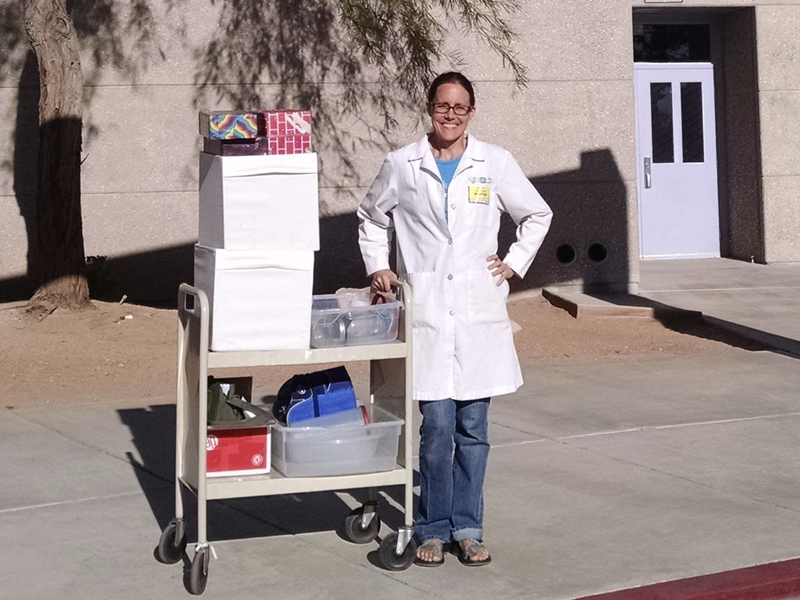 I’ve been collecting science material for years and have more than 30 Science Mom lessons that I’ve shared in schools as a volunteer. That all depends on the video. But it takes WAY longer than most people think. It’s not unusual for one of my Science Mom Guide videos, which are 10 to 15 minutes long, to require between 50 to 90 hours of work. The editing takes longer than the filming, but exactly how long all depends on the project. In general, the longer the video and the more cartoons and illustrations the video has, the more time it took to make. WHAT DO YOU WRITE AND WHEN CAN I READ YOUR BOOKS? I write in a variety of genres, and my first published books can be seen here. I’ve also written several books which have not yet been published. 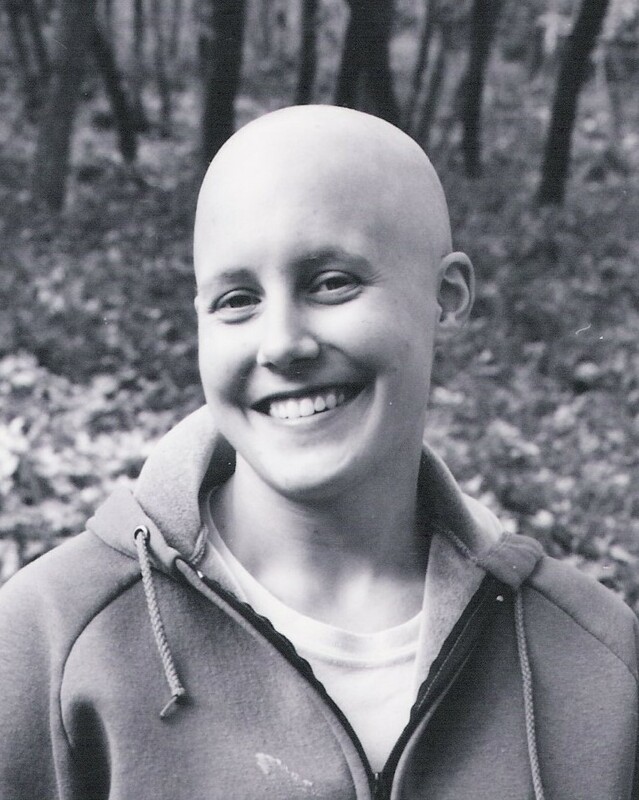 In 2012 I wrote a memoir about my experience with cancer and postpartum depression. I did a big reader survey in 2013 where I printed 100 copies and gathered feedback from more than 100 readers, half of whom had not met me personally before reading the book. That survey was a great experience and I learned two things: First, the book needed a significant edit before I would send it out to literary agents again or consider self publishing it. And second… maybe I didn’t want to have such a personal memoir published? I put it on the shelf and decided I would revisit it after finishing my novel. I started my first novel in late 2013. The first draft was junk, and I tossed it. The second draft was less junky, but what it really needed was a prequel to explain how two very different societies came into existence. I wrote the prequel, and then broke that prequel into two books. So the single novel grew into a trilogy, and is currently sitting on a shelf because I’m not in the mood to write about a post-apocalyptic setting when our current affairs are rather disheartening, to say the least. Currently, I’m working on a few middle grade novels. WAIT, DID YOU SAY YOU’VE HAD CANCER? Yep. I was diagnosed with Hodgkin’s Lymphoma when I was 20 years old, and went through six months of chemotherapy and radiation. Lost my hair and had terrible nausea… all that stuff. After the birth of my third child, I had post-partum depression. And the depression was worse than the cancer. That’s a whole different topic than Science Mom stuff, but the upshot is that depression is a very real and very difficult illness. If you or someone you know is struggling with depression, be kind and patient with them. Reach out for help, and know that you’re not alone. If you want to keep in touch with what projects are coming up, you can follow me on social media. I post announcements of new videos on TheScienceMom facebook page and twitter (@JennyBallif), and occasionally post to instagram as well. But to get the BEST scoop on upcoming projects, subscribe to my Patreon page! It costs as little as $1 a month, and I put more detailed posts about upcoming projects there.